Bruce Fox is a partner and co-founder of Fox & Farley. His personal injury practice focuses on automobile accidents, workers’ compensation, products liability, hospital and nursing home injuries, and trucking litigation. In addition, Bruce has significant multi-state lead counsel Class Action litigation experience against a variety of defendants. Bruce is co-founder of the Energy Workers’ Legal Resource Center in Oak Ridge, Tennessee, a law firm dedicated to helping local energy workers sick with serious lung diseases, cancers and hearing loss as a result of their work for various Department of Energy contractors. Bruce has practiced law for over forty years, and has tried over 125 state and federal jury trials to completion, and has tried over 400 nonjury cases as well. Most of his clients are referrals from past clients and other attorneys, and many of Bruce’s clients have sought his counsel and representation on a repeated basis over the years and decades. Bruce grew up in Clinton, Tennessee. At home in the hills of rural East Tennessee, Bruce’s physical surroundings were humble, but he was rich in the love of his parents and family. From them, he learned the value of hard work, integrity, and fairness. Bruce attended college and law school at the University of Tennessee. Upon graduation from the University Of Tennessee College Of Law, Bruce left to study in England, at Cambridge University. Bruce completed an advanced law degree at Cambridge, and holds a LLB in International Law. He is a current Master of the Bench of the Hamilton Burnett American Inn of Court in Knoxville. He is one of approximately 100 Tennessee lawyers selected for membership by the American Board of Trial Advocates (ABOTA). In 2011 he received the Paladin Award for East Tennessee from the Tennessee Trial Lawyers Association. The award recognizes TTLA members who achieve outstanding results for a client despite great obstacles, and who work to protect the civil justice system. Bruce serves on the Executive Committee and the Board of the Tennessee Trial Lawyers Association. In 2007, 2008, 2009, 2010, 2011, 2012, 2013, 2014, 2015, and 2016 he was named to the Mid-South Super Lawyers. In 2008, 2009, 2010, 2011, 2012, 2013, 2014, 2015, and 2016 Knoxville’s Cityview Magazine named Bruce one of the area’s best lawyers in the areas of workers’ compensation, hospital litigation, nursing home neglect, auto accident, class action, personal injury and wrongful death. Bruce is a frequent speaker and lecturer to attorneys and judges at seminars and legal education forums throughout the Southeast and Midwest. 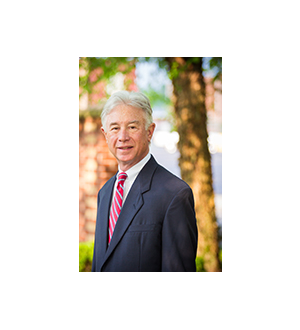 He has taught on topics ranging from underinsured and uninsured motorist coverage to Tennessee Workers’ Compensation Law to automobile and truck accident law. In early 2008, Tennessee Governor Phil Bredesen appointed Bruce to serve as a member of Tennessee’s Workers’ Compensation Advisory Council, and Governor Bill Haslem re-appointed him in 2011. Bruce works in this capacity to shape legislative policy and law applicable to the rights of injured workers in Tennessee. Bruce believes strongly in the rights of children, particularly injured or special needs children. He works with the East Tennessee Chapter of the Autism Society of America in its efforts to raise funds and promote awareness of autism and autism related issues. Bruce has contributed many hours towards the goal of increasing autism awareness through public and private fundraising to benefit the East Tennessee Chapter of the Autism Society of America. Bruce is married to Mary Jane Fox and lives in Knoxville, Tennessee. He has six grown children, seven grandchildren, and two more on the way. Away from work, Bruce spends time with his family, enjoys traveling, and has traveled extensively throughout Europe. He is an avid snow skier, hunter, golfer, and dotes on his beloved Labrador retrievers, Ty and Woodrow, which he runs and handles in AKC Hunt Tests and Field Trials.